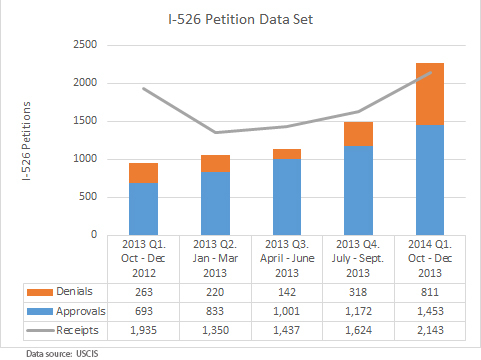 USCIS has posted EB-5 petition processing statistics for the first quarter of FY2014 (October to December 2013) on the Immigration and Citizenship Data page. I hope that the increasing volume of I-526 decisions reflects operational improvements, and not just California Service Center adjudicators hustling to get files off their desks ahead of the February 2014 hand-off to the new Washington DC Investor Program Office. 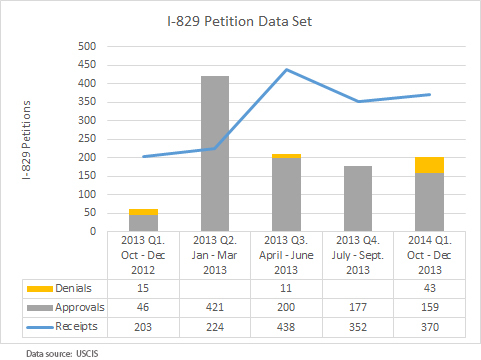 In any case the I-526 trend is significant, with the number of approvals increasing by around 20% every quarter last year (and the total number of decisions up 41% between the last two quarters). This is good news for processing times, and also an indicator that we’re accelerating toward the annual EB-5 visa cap. USCIS has cautioned before against reading much into the number of denials that happen to occur in any given quarter, but I’m still intrigued by the recent spike in denied petitions. It will be interesting to see how second quarter statistics look, with new staff handling I-526 and the CSC free to focus on I-829 petitions. I’ve visualized USCIS quarterly data in the following charts. Meanwhile, the IPO is continuing to crank out I-924 decisions. I will be posting from the IIUSA annual meeting this week, and look forward to seeing you there. Dont know if you can provide the I-924 approval letter for the US maingate regional center? or thanks for your guidance on How to obtain the I-924 letters from a channel rather than from the RC itself? If the Regional Center is unwilling to release its letter, the alternate channel is to make a Freedom of Information Act request to USCIS. The USCIS electronic reading room posts letters through 2012, and IIUSA has obtained a batch through 2013 via FOIA request but not published them. In my opinion, a Regional Center approval letter is a license and should be made public, but I don’t know how many others would like to join me in agitating on that point.